The Ethics Commission during deliberations at the end of July in Athens. 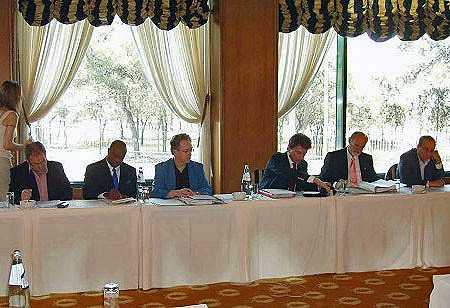 From left: Ms. Elli Sperdokli (Fide secretary in Athens), Lawrence Ball (South Africa), Ian Wilkinson (Jamaica), Dirk JA De Ridder (Belgium), Roberto Rivello (Italy, Chairman), Ralph Alt (Germany), Noureddine Tabbane (Tunisia). Photo by Michalis Kaloumenos.